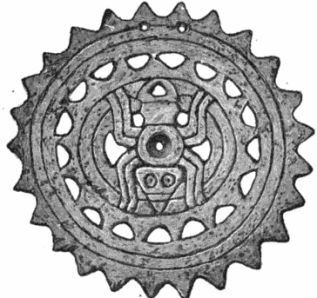 The Spider symbol featured strongly in the Mississippian culture of the Mound Builders and the legends and mythology of the Native American tribes. In Cherokee mythology the water spider is said to have first brought fire to the inhabitants of the earth in the basket on her back. Among some American Indians is the legend of a "Spider Man," whose web connected the heaven worlds with the earth. Spider Woman, or Spider Grandmother, strongly feature in Hopi myths served as a messenger and teacher for the Creator and was an intercessor between deity and the people. The spider woman taught people how to weave and the spider symbolized creativity and was the weaver of the fabric of life. For additional information refer to Power Animals. 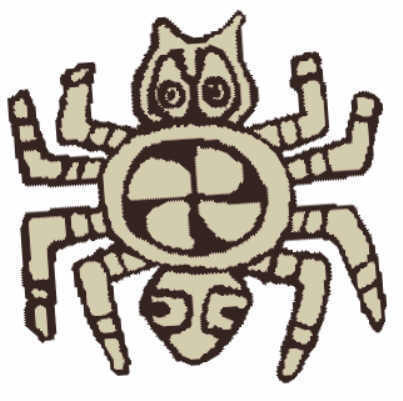 In Lakota Sioux mythology, Iktomi is a spider trickster and shape shifter spirit - refer to Tricksters. His appearance is that of a spider, but he can take any shape, including that of a human. When he is a human he is said to wear red, yellow and white paint, with black rings around his eyes. The Seneca tribe, one of the six nations of the Iroquois Confederacy, believed that a supernatural spirit called Dijien was a man-sized spider who survived fierce battles because its heart was buried underground.